This film is on the Best of 1998 list. With its glam rock stylings, there's going to be some loss of intensity on the small screen, but the personalities are strong enough to float the pic on a TV screen. Worth seeing, regardless of circumstances, but turn the lights out and give it undivided attention. Marrying the narrative structure of what is arguably film's greatest achievement with the life of rock'n'roll's most consummate showman, "Velvet Goldmine" is an ingenious combination of legendary 20th Century pop culture. Literally a glam rock version of "Citizen Kane," with the fictionalized spotlight turned on David Bowie instead of William Randolph Hearst, writer-director Todd Haynes ("Safe") has created a remarkable fabricated history of a moment in rock music that looks, feels and tastes like the real thing. "Goldmine" follows the structure Orson Welles' used for "Citizen Kane," documenting the rise and fall of a glam rock superstar -- Brian Slade (Jonathan Rys Meyers), a very thinly disguised Bowie-esque pop idol -- through flashback vignettes told by his contemporaries as they are interviewed by a reporter on the 10th anniversary of his disappearance after a publicity stunt that ruined his career. Among others, the reporter (Christian Bale) interviews Curt Wild (Ewan McGregor), Slade's hard-living collaborator, rival and sometime lover -- the Iggy Pop character -- and his bitter, lounge-singer ex-wife (Toni Collette), a parallel of both Angela Bowie and the Charles Foster Kane's talentless, drunk ex. The film documents Slade's early days as an aimless post-hippie singer who hadn't found his voice then follows him through the invention of his glam persona (think Ziggy Stardust) that launches him into super-stardom, capturing precisely the period's pandemonium of androgyny, bisexuality, drugs and rock'n'roll. The story is familiar enough that none of the circumstances feel particularly original, but Haynes execution is nothing short of inspired. The film is shot in a 1970s cinematic style, and the director taps prehistoric music video visuals for fantasy sequences, creates you-are-there concert footage and chooses the best music of the day to create a relentless soundtrack that gives "Goldmine" the energetic effervescence of a cocaine-induced euphoria. Meanwhile, Meyers and McGregor manifest the glam rock attitudes (fey, petulant pouts, sexual stage antics) and concealed insecurities of their largely dazed characters so fully that it lends them an almost tragic depth. Toni Collette stands out as something of an escapee from Slade's destructive world, who a decade later is clearly worse for the wear. And Christian Bale gets to flesh out his reporter quite a bit, struggling with his own memories of his volatile post-pubescence during the era he's revisiting. 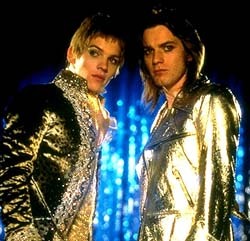 Packed to the rafters with metaphors, "Velvet Goldmine" seems to run out of creative fuel somewhere in the final 20 minutes, falling back on cheap prop symbolism in an unnecessary attempt to stick strictly with the "Citizen Kane" thing. I'm sorry, but a hand-me-down brooch just doesn't cut it as this movie's Rosebud. But by the time it peters out, this creative, smart and stylish film has made such an impression that the unfortunately pedestrian epilogue is a trifle. "Goldmine" should garner a few Oscar nods for production design and costumes, but its real legacy may be as a midnight movie. This picture has definite cult potential.